YEAHHHH - one step towards more EASE for Legal Expats living in Costa Rica and less bureaucratic *#$%&@+^ / work for the government!!!! Let's hope this trend catches on!! 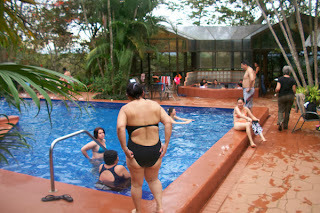 The system for expats will work the same way that the current system does at the Banco de Costa Rica. Invited to the Connection Practice Course at UN University for Peace in Costa Rica! 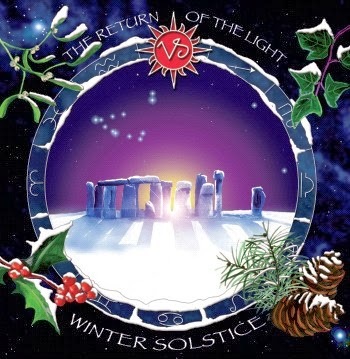 Les invito tomar el tiempo de leer lo siguiente y les aliento empezar el nuevo año con la paz en sus corazones obteniendo herramientas que van a servirles toda su vida. Calling all Shamans, yoga teachers, hula hooper, fire dancers, aerial silk, bring your talent and CREATE. Can you lead a sweat lodge on the full moon? 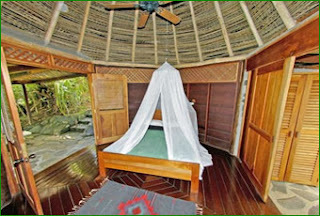 Would you like to learn PanEurhythmy- a dance of higher consciousness at sunrise, yoga in the Bamboo Cathedral, music under the stars Friday night, drumming circles and ceremony on Saturday night. 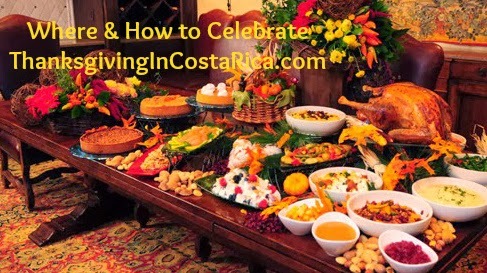 THANKSGIVING - Where to Celebrate U.S. Thanksgiving in Costa Rica & Where to Find all the Fixin's needed • Substitutes (Tico-izing things) - 2013! 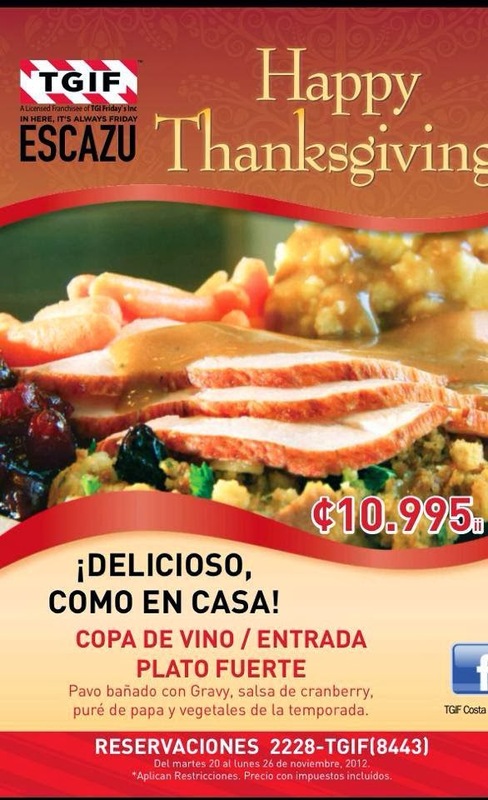 Ok, sure, we've left the U.S. and Canada and some ream us for holding on to anything that's American (especially some of our food tastes) but ya know, sometime ya just GOTTA get a familiar fix and it seems that Thanksgiving is one of the BIG TIMES to do that for ExPats living in Costa Rica. 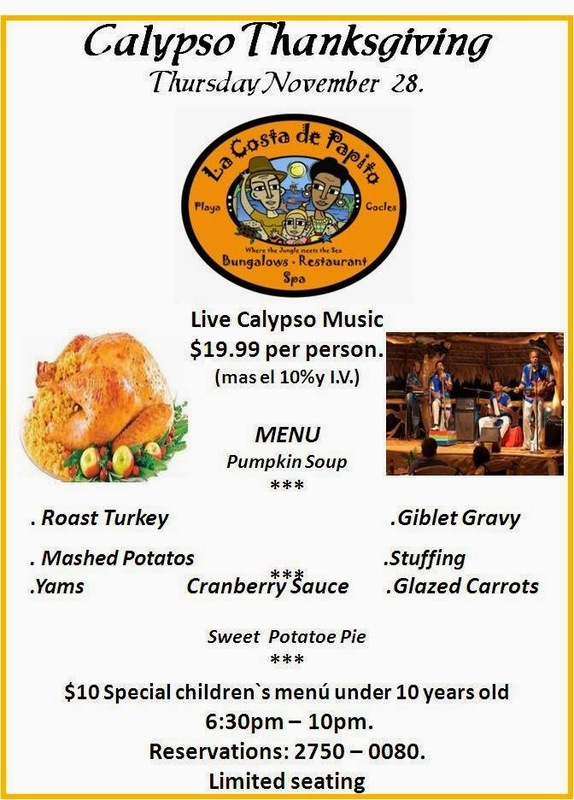 Heck, even some of my anti-anything U.S. friends leave their little villages to come together with other ExPats to celebrate Thanksgiving so it has gotten to be QUITE the POPULAR "holiday" throughout Costa Rica - thanx to the large ExPat communities around the country! 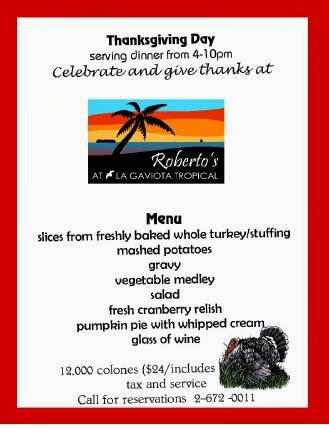 Many ExPats are even bringing their Tico friends to experience this INSANE holiday of GLUTTONY!! For those not from the U.S. or Canada and unsure what all this hoopla is about - Thanksgiving happens in the U.S. on the LAST THURSDAY in November and Canada's 2nd Monday in October. WHAT'S THE TYPICAL FOOD FOR A "TRADITIONAL THANKSGIVING"
(keep this in mind when I refer below to a restaurant serving "Traditional Thanksgiving food"). 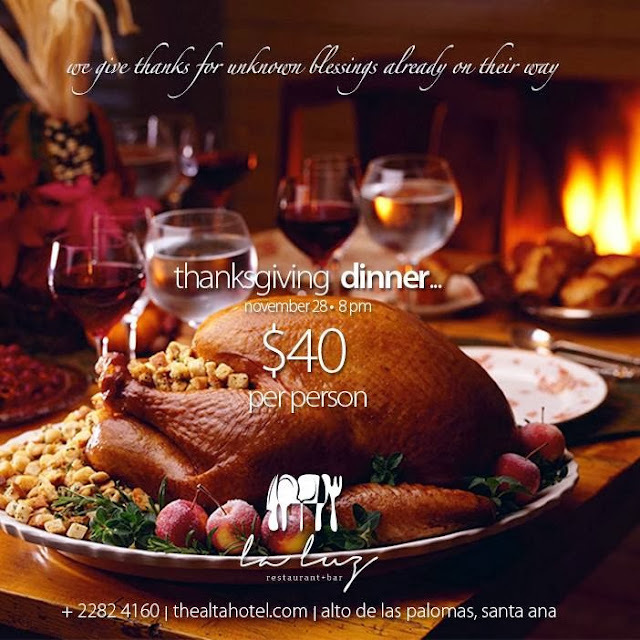 Check out some of the SPECIAL places and deals to celebrate Thanksgiving like . .
• Who has the BEST DEAL if you're a Lady or Senior! • Vista del Valle where dinner includes a Day Pass to their Pool, Jacuzzi and grounds including a good walk to a beautiful waterfall! has a few more spaces because Alfie's reservation line was not working! • Or the Opera Concert at Osa Mountain Village Resort! I'm STILL adding things to this guide so "Bookmark" it and keep coming back!!! Click here for all the other info!!! . . . . WHEN IS U.S. THANKSGIVING 2013? 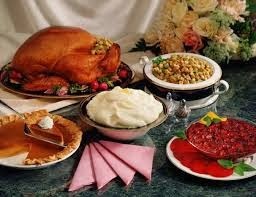 VERY SADLY we have seen some popular places that have been serving delicious U.S. Thanksgiving CLOSED!! 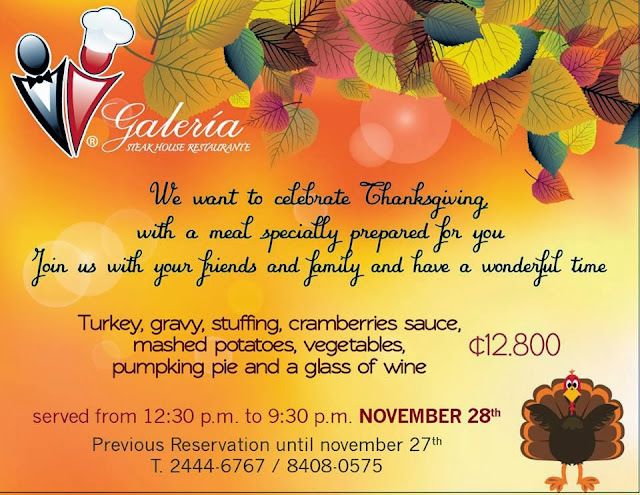 Do you know other restaurants having U.S. Thanksgiving Dinner or of any Thanksgiving related items or have anything to add/change? 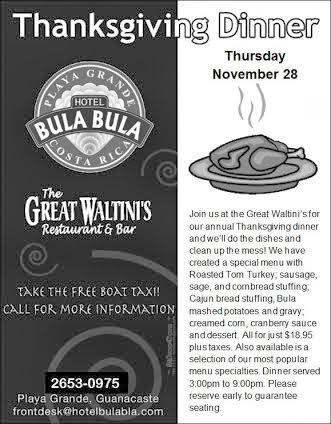 One Plate served to you with Traditional Thanksgiving Dinner PLUS Pumpkin Soup, Yams and Sweet Potato Pie. The BIG Community Potluck in Grecia has been sold out for MONTHS but keep it in mind for the future as it's quite the Potluck with around 100 ExPats! E- me and I'll get you a connection!!! FYI - the church holds worship service in English for expats on Sundays at 8:30am. BEST PLACE TO ENJOY A REALLY SPECIAL THANKSGIVING!!! (I did this 2 years ago and it was GREAT!!!!! I even spent the weekend there! Need a MAGICAL BREAK?? Check out their DAY PASS SPECIAL and their ROMANTIC COUPLES (or single person that just wants to chill) SPECIALS below!! $155 for 1-2 people (taxes INCLUDED!!)!! Roasted Tom Turkey • STUFFING with Sausage, sage and Cornbread OR Cajun Bread Stuffing • Bula mashed potatoes and gravy • Creamed Corn (the BEST Creamed Corn I've EVER tasted!!) • Cranberry Sauce and Dessert. Their regular WONDERFUL menu will also be available to choose from instead. FREE WATER TAXI RIDE FROM TAMARINDO FOR DINERS!